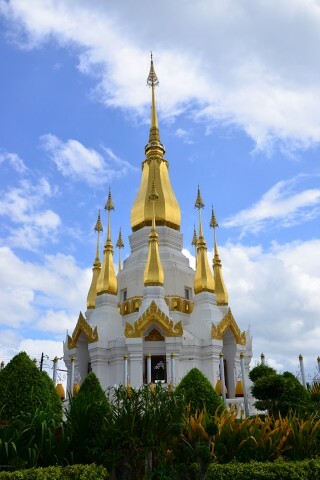 Wat Tham Kuha Sawan was established when the late Forest Tradition monk, Luang Phor Khamkhaning Chulamani, discovered a small cave in the hillside to be suitable for meditation in the mid 1970s. More of a rock shelf than deep cavern, the cave now contains several Buddha images to go with a view over Khong Chiam’s rusty rooftops and the Mekong River beyond. The temple’s most noticeable feature is a shrine room topped by a graceful golden chedi and surrounded by eight smaller chedis. Since his death in 1985 at the age of 91, the founding monk’s body has lied behind glass in a mummified state that supposedly resulted from his meditative mastery. An English information board recounts a brief biography of the revered monk, who was born in Laos and lived much of his life in Vientiane. The grounds also feature a large naga-hooded Buddha image and a smaller Buddha seated under a twinkling silvery pavilion near the road. A few vendors try to take advantage of the founder’s miraculous powers by selling lottery tickets to the Thai tourists. On your way into the cave, wander around the massive elephant statue for a great view of the Mekong. Beginning off Highway 2173 to the northwest of town, a steep stairway leads up to the temple’s back entrance, which was originally its main entrance. It’s more easily accessed from Highway 2222.